How’d you like to get your hands on over 60 free thriller books? Hey there, a very Happy New Year to you. 2019, eh? Nearly at the end of the second decade of what could charitably be called ‘that difficult third millennium.’ Only 98 more decades to go! I know, I know, looking back at the past with rose-tinted glasses is a fool’s game, or at least one best left to the Brexiteering Gammons sneering at Vegan Sausage Rolls and Halal Toblerones. But it’s hard not to think back to those first few months of the year 2000 – before those planes flew into a building, when the internet didn’t look like a piss-filled boil, when the Backstreet boys looked like music’s nadir – and wonder how much more of an inexorable decline we’re in for, as a species. On which note, how would you like some free Apocalyptic books?! I mean, am I king of the segue, or what? I should be on Radio 2 or something. Anyway, Blood on the Motorway is one of over twenty novels and novellas with a decidedly end-of-the-world slant available on Bookfunnel’s ‘In the Dead of Winter’ promotion, which is running throughout January. The price? Absolutely free! There’s some cracking authors involved in this one, too, including the excellent Steve Turnbull. I can thoroughly recommend you pick up his book Purity, but there’s a load of others in there, too. And, of course, if you’ve not yet picked up Blood on the Motorway, the first book in my apocalyptic thriller trilogy, now’s as good a time as any. The best part is, Bookfunnel will deliver your free books anywhere you’d like, digitally speaking. Send it to the Kindle App on your phone, send it to Apple Books, Kobo, or just download it straight to your phone. The choice is yours. And what better way to pull yourself away from the fear and loathing of your social media feed than to have a prime slice of apocalyptic fiction to read on your lunch break? So hit the button now, grab yourself a free book or three, and get your fill of the world’s end before the real thing comes along. Take me to all the free books! 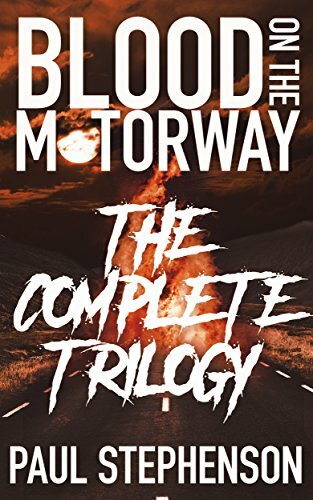 Blood on the Motorway: An apocalyptic trilogy of murder and stale sandwiches is out now in ebook and print from Amazon and all other good bookstores. You can get the first book free by joining my mailing list or read along at Wattpad. Oh, and I’ve got a Patreon, where subscribers get a free short story every single week, along with a range of other goodies. Who needs a writing degree anyway? Chronicles of Mar Word Count: The same as last week. When the time came for me to choose a university degree, I weighed up the pros and cons of every option available to me, as one should when making a decision of such obvious importance. I knew, thoroughly knew that I wanted to be a writer. But, back then, as someone who’d just discovered Hunter S Thompson’s wonderful world of gonzo journalism, I had moved on from the childish dream of becoming Stephen King. No, I was going to be a JOURNALIST. I was going to crack the biggest stories of the day while receiving free albums and books and possibly taking mescaline. I wasn’t really sure. But journalism, that was the thing. I believed it in my very core. I was going to do IMPORTANT WORK. This was before Leveson, naturally. These days that title is lodged somewhere between Phil Collins and Piers Morgan. Now, you’re probably thinking that, naturally, I took the course that aspiring journalists the world over had done before - English Literature. But no. This was the late nineties, and we were all dazzled by the bright lights and heady excitement that was… Media Studies. So, off to the north I popped, and did my Media degree. I’ve barely used it since. After all, one doesn’t really need to be able to interpret the Frankfurt school much in order to do a boring desk job. Now, as a wizened old man looking back through tears of regret, I keep looking back at that little idiot with the terrible curtains and think - why the hell didn’t you do an English degree? Now, I can’t go back to university to do a literature degree, or heaven forfend a creative writing degree, what with the having of the kids and the crushing responsibilities of actual adulthood, plus my burgeoning career as a sub-mid-list indie author to prop up. But, heavens to Betsy, I sure would like to. Luckily, I live in the period that is now. Since I finished working on the two arcs I had been working on, I’ve given myself a few weeks off to try and do some digging into craft. I’m less than a week in, but the resources I’ve found are overwhelming. Now, I’m not about to say to any young aspiring writer that they don’t need to go get that degree they were planning on ploughing themselves into debt for. But for those of us for whom that’s not an option, there really is a wealth of knowledge out there for you to marinate in, trying to absorb as much of it as you can. So, here are three great things I’ve found so far. This is a series of online courses, with a free period that I’m currently burning through like it’s kindling. So far I’ve done a fantastic course by Daniel Jose Older on storytelling fundamentals, one on Journalling by Emily Gould, and one on writing for Wattpad by Rebecca Sky, each of which led to copious pages of notes being hastily scribbled over less than an hour. And, hey, if you go sign up with this link, they'll give me a few more free months. Free months are good. Now, I don’t want to blow your tiny minds or anything, but there’s this new site called Youtube, and it has videos on it… yes, okay, I know this is hardly going to be revolutionary news, but there’s a ridiculous amount of free writing resource available these days — from Brandon Sanderson’s 12-hour masterclass on writing to the excellent 10-minute bites of truth dropped by Jenna Moreci each week. This hyper-analytic approach to self-editing by story guru Shawn Coyne has completely blown my mind over the last few weeks and months, as I devoured all the videos on his youtube channel, wait patiently to see if my lovely wife will buy the book for my birthday, and burn through all the podcasts he does with Tim Grahl. If you want to get deep under the hood of storytelling, this is the place to go. It's ridiculous, really, to have such abundance of free learning all around us. Whatever you want to do with your life, or whether you just have a broken toilet, chances are you'll find someone online willing to teach you how to do it (or fix a toilet). You might not get a piece of paper at the end, but at least you'll know how to do it. So, while I take a break from writing, I’m filling the void with, um, more writing. Anyone would think there’s something wrong with me. And since I'll be doing more deep dives, what online resources could you not do without? Before I away, I’ve put together a bookfunnel giveaway that’s running for the next two weeks of over twenty free horror books, of which Blood on the Motorway is one of the chosen (helps when you get to be the chooser). Go check out the page if you want to get some free ebooks, there’s some cracking reads in there. Oh, and tell all the people you’ve ever met about it, too. Cheers.